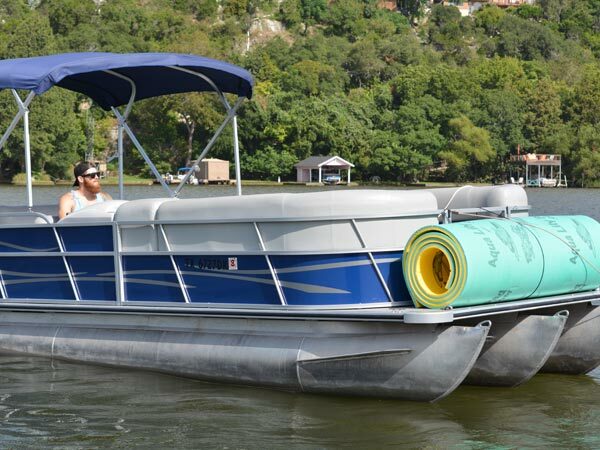 Float On offers Lake Travis boat rentals with a fun captain, yeti cooler and aqua lily pad. Come experience for yourself why we’re Austin’s top rated boat rental company! We’ve been renting out brand new 24ft Blue Bentley Tritoons for you to enjoy with up to 12 of your friends out on Lake Travis. Our pickup/drop-off spot is conveniently located at Hurst Harbor Marina – 16405 Clara Van Street Austin, TX 78734. We’ll also continue to also offer Lake Austin boat rentals. The main reason folks come to Lake Travis is to get a first hand look at the world famous Devil’s Cove. Tie up to one of the many rows of boats and party alongside other folks wildly enjoying their day on Lake Travis! Or, anchor nearby and watch the hooligans get wild from a safe distance. 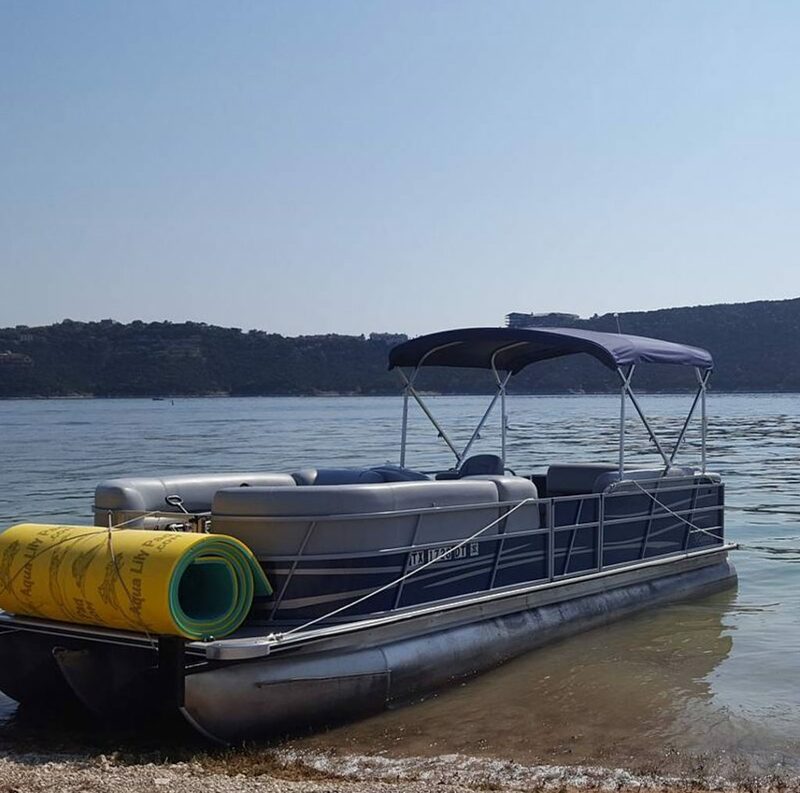 If you rented a boat with Float On – Lake Travis Boat Rentals you’ll be turning heads with the Aqua Lily Pad float. Either way, no boat rental on Lake Travis is complete without a visit to Devil’s Cove. Just recently Ernie’s on the Lake took over the old Carlos n’ Charlies location on Lake Travis just across from Devil’s Cove. Stop by for some munchies or quick drinks during your boat outing! The multi-level restaurant, bar and music venue offers the choice to observe the waters from decks or within the glass-enclosed restaurant. Since you’ll be coming by boat through your Lake Travis Boat Rental you’ll be happy to hear they have many courtesy docks available to make your visit to Ernie’s on the Lake a breeze. Our new favorite place to eat is Shack 512. “Our place is your place, a warm welcoming environment where the food is awesome and the views are better!” Their sunsets are also spectacular from their patio. For a more family friendly environment you can check out zip-line cove and possibly get a peek of some adventure seeking zip liners enjoying Zipline Adventures. 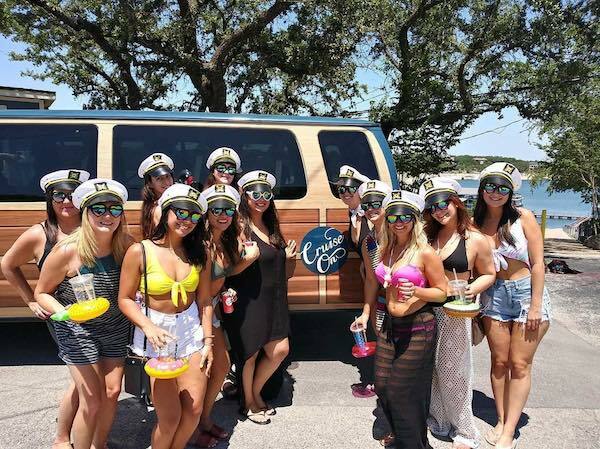 Come check out Lake Travis boat rentals with Float On and see what all the hype is about!